Fun elsewhere on the 'Net. Barack Obama says the PLEDGE OF ALLEGIANCE every time he sees an American flag, and he has an American flag in EVERY ROOM in his house. Some days it takes him OVER 45 MINUTES to get out of his house. And I thought he was a whishy-washy Liberal with no values to speak of. I stand corrected. In case you're wondering why Microsoft revised its versioning switch default: it's because of Bruce Lawson. & Ceiling Cat sawed teh light, to sees stufs, & speraratered the light form dark & stufs but taht wuz ok cuz cats can seez in teh dark & not tripz ovr nethin. In maybe-related news: today I read that the Dutch police have arrested a Nigerian musician who had a #1 hit in Nigeria about ... email scams! WHATWG to start work on "Bible5"
Web 1.0: Joshua Davis on the cover of Art News. Web 2.0: 37signals on the cover of Forbes. Truly, Web 2.0 is conquering the world. Where does all this lost CSS end up? 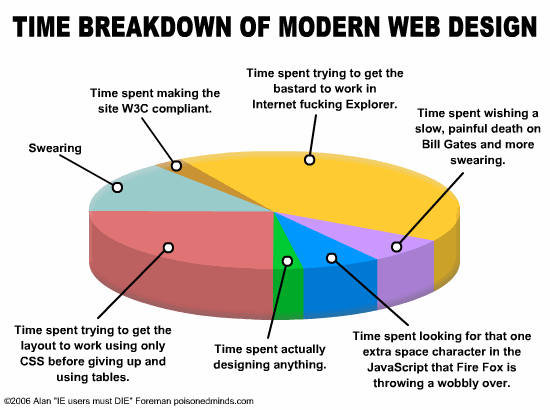 Inside web developers; and insurance companies profit from it. Read Molly's entry, then read comment 4 for the full story. Andy Clarke gathers horror stories about lost code in order to shore yp a brilliant recent article in PC Magazine. See comment 8 for the story of my most devastating code loss. Web 2.0: It's ... like your brain on LSD! The article's several months old, but still spot-on. Because you'll need it one of these days. As it says. Useful tips, including the proprietary GR(tm) system. These people really understand Web 2.0! The time is updated every single minute via XMLHTTP, and the site even features a list of previous times!